Hela is the Asgardian goddess of death and is a villain known for clashing with Marvel hero Thor. Hela is a half giant / half goddess ruler of one of the Norse mythical lands of the dead known as Hel and Nilfheim. She is the daughter of previous incarnation of Loki and the giantess Angrobooa. Hela does not control the realm of Valhalla the warrior realm of the dead but has often sought to conquer it. Valhalla has generally been ruled by Odin. Actress Cate Blanchett plays Hela in Thor: Ragnarok the third film in the MCU Thor franchise. Hela is based off of Hel the Norse goddess of death. See this amazing Hela cosplay by Belle Chere! Hela is a powerful goddess that is born from a previous incarnation of Loki and the powerful giantess Angrobooa. She is eventually given control of some of the realms of the dead by Odin including Hel and Nilfheim. Odin however keeps control of Valhalla the warrior's realm of the dead for himself. This often leads to conflict between Hela as she believes she is the rightful ruler of all realms of the dead. Hela also has conflicts with other underworld deities such as Pluto, Amatsu Mikaboshi, Satannish, and Mephisto. She also covets powerful souls and often seeks to trick Thor and Odin to coming and staying in Hel. Hela managed to steal a portion of Odin's soul and used it to create a powerful entity called Infinity. She used Infinity to take control of Odin. 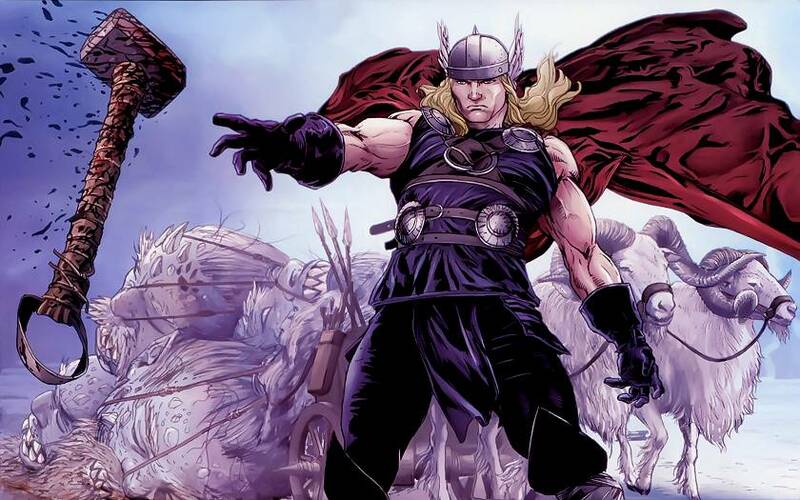 Only with the help of one Hela's allies the Silent One was Thor able to free Odin from her grasp. Odin then slayed Hela but returned to her life after Thor wisely pointed out that balance between death and life needed to be maintained. Later Thor himself would be slain by Hela and was only brought back to life when Sif promised to take his place. When Odin was killed by Mangog a war lit up between Pluto and Hela over the right of his soul. In the Hela seemingly lost the soul to Pluto but she avoided by defeat by bringing Odin back to life. Hela and Malekith had a plot to steal souls from living people on Earth. This plot was thwarted when Thor, Balder, Skourge the Executioner and the Einherjar invaded Hel. The group of war gods battled the legions of Hela's dead and demons before freeing the souls. Hela managed to curse Thor with Immortal Life but Brittle Bones for his part in the invasion. This meant that Thor would have a hard time being a super hero and could spend eternity as an undying bowl of flesh soup. Tony Stark helped Thor build a suit and later Thor would use the body of the Destroyer itself to take the battle to Hela. He eventually battled her to the point where she agreed to lift the curse. Hela is Hela Powerful. (Sorry I had to do that). Hela has the standard array of Asgardian powers: Super Strength, Agility, and Durability. These are all enhanced by a magical cloak she wears. With the cloak Hela is at a similar strength level as Thor. Hela's cloak greatly increases her strength but also keeps her immortal and unaging. With her cloak she is young, vibrant and powerful however without she reverts to her true form. In her true form the left half of her body is decaying. The extent of the decay is such that she is not able to walk well much less run well. Hela also has a powerful, magic sword called, "Night Sword" and is a highly skilled swords woman. Hela has vast magical powers. She has been shown to be capable of teleportation, astral projection, fire deathly energy blasts, levitation, aging (she can cause someone to age prematurely at a highly accelerated rate). She also has used powerful curses such as when she made Thor immortal but his bones brittle. Her most feared spell is called the "Hand of Glory" which allows her to kill a powerful entity with a single blow. This is different that her death touch as it is more powerful. As a goddess of death, she has been given vast powers to reap certain souls and bring them to her domain of Hel. She has death touch ability to kill the living and also the ability to reap souls (Bring the soul to her domain). She can also travel anywhere. She has also been to have the ability to restore people to life. As ruler of the undead worlds Hela can command the denizens that live there which includes legions of dead and demons. Actress Cate Blanchett plays Hela in Thor: Ragnarok the third film in the MCU Thor franchise. Here is the first picture of Cate Blanchett as Hela from the film. This picture was released by Entertainment Weekly. In the same interview Kate Blanchet describes Hela as “a little bit cross,” due to her being imprisoned for thousands of years by the Asgardians. Tend to think a bit cross is an understatement. The same Entertainment Weekly interview asks her how she feels about being the first female villain in an MCU film which I actually don't think is right. Nebula was a female villain, there were 2 female villains in Iron Man 3, Black Widow was also used as a pseudo villain in Iron Man II. I digress though maybe they meant main villain and those others do not count. I will also say that Kate was asked what she felt like to be the first female villain by Entertainment Weekly so it was really the interviewer who made that statement. Blanchett also revealed that the Hela headdress/ mask will appear and that times she will be unmasked and times she will be masked. Apparently her and directer Taika Waititi put a lot of thought into which scenes she should be masked for and which not. She also said that one of Hela's powers is an ability to manifest weapons out of different parts of body which could play out very cool in film. Initial teaser of Hela confronting Asgard.